When I first started learning about Lean Six Sigma and familiarizing myself with all the different terminology and methodologies, I was a little overwhelmed and confused by all the acronyms. FMEA, C&E Matrix, Gage R&R, SIPOC, DMAIC…the list goes on and on! 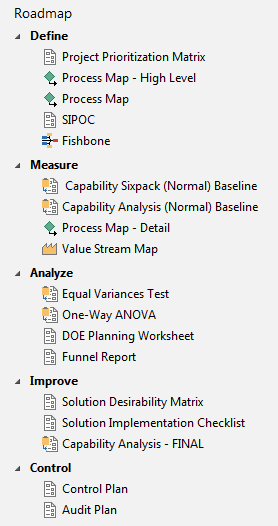 However, I really got tripped up by the similar-sounding acronyms of DMAIC, DMADV, and DFSS. These acronyms stand for the most common Lean Six Sigma project methodologies, which help quality improvement practitioners keep their projects focused with an established route to follow for completion. Each methodology is made up of five phases and the name of each phase makes up each letter in the acronym. First off, DMADV and DFSS are essentially the same process. DFSS stands for “Design For Six Sigma,” and is just another name for DMADV. DMAIC is the more well-known and most-used Lean Six Sigma project methodology and is focused on improving an existing process, rather than creating a new product or process like DMADV. D — Define the problem with your product or process. M — Measure your current process and collect data. A — Analyze your data to find the root causes of defects. This post highlighted the best ways to ensure your lean Six Sigma Project succeeds based upon a Minitab survey of nearly 200 Six Sigma practitioners at all skill levels from major companies. One of the most important components of good project selection is choosing a project most likely to benefit from the DMAIC approach. In other words, a good project involves a measurable defect, or a process for which changes can be measured accurately. However, whether or not you are using DMAIC or DMADV, the real benefit of these methodologies is picking an approach and sticking with it without skipping any steps or phases. In Companion by Minitab, the customizable Roadmap is delivered with a DMAIC template. If your quality team had additional steps, they can easily be added to the Roadmap to create your own template for future projects. What Lean Six Sigma project methodologies do you follow when conducting a quality improvement project?